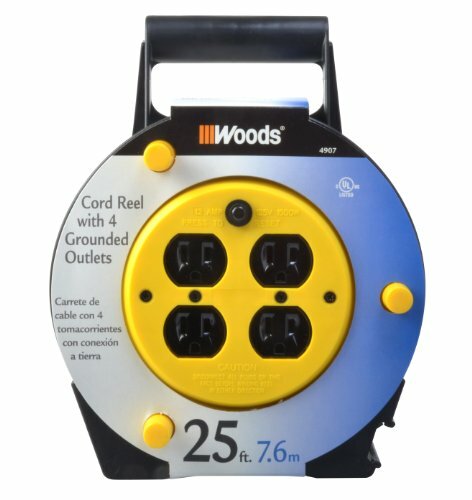 Woods 4907 25-Foot Extension Cord Reel with 4-Outlets and Circuit Breaker. High impact durable case with top and rear handles. 4-integrated grounded outlets for up to 1500-watts of power. 25-Foot SJTW 16/3-Gauge extension cord with 12A circuit breaker. Easy to use comfort handle in top and back of unit. Great for the garage - quality cord jacket provides protection against moisture, abrasion, oil and chemicals. 25-foot cord reel is rated for Indoor Use in dry locations only. Cord reel features feet on backside, which allows unit to be placed on back or top up. UL Listed and cUL Listed. The Woods (R) brand is a registered trademark of Coleman Cable Inc.